Autumn, harvest time. My husband Klaus and I visited his mother to help her with the work. Despite her age she still attended to her large garden. This year, everything had thrived particularly well: on the trees and shrubs the mature fruit dangled, the flower beds sported magnificent vegetables, flower beds shone with flashily colored, strangely shaped dahlias. The whole garden was so inspiring that I took advantage of every break to paint. Now all the apples were picked, pumpkins harvested, the hedge trimmed and the lawn mowed - time for the return trip to Berlin. While Klaus repaired the kettle in the house and mother had her siesta, I painted outside in the shade of the old apple trees, enjoying the idyll. It smelt of late summer and autumn, earthy due the turned soil and freshly mown grass. The wind was still, sunny, mild, only the whirring insects buzzed and the birds chirped, sometimes a peacock butterfly pranced past, sunbeams filtered through the branches, the sky was blue and sparkling. It was almost as if time was holding its breath. My painting was as good as finished, as Mum, leaning on her cane, came into the garden and joined me. “Do you like it?” I asked, holding up the drawing pad, so she could see the picture. “Oh, you could have chosen another subject for painting. Flowers, yes, but my old wheelbarrow! That is not so nice” - “Don’t you always say: One man’s trash is another man´s treasure?” – “Yes, that is true”. 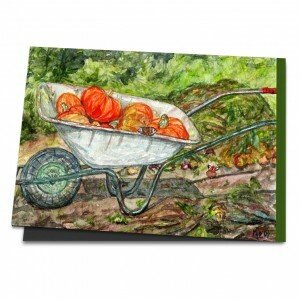 And so she sat down relaxed next to me on the wooden bench and watched as I finished the picture and pushed the wheelbarrow full of pumpkins to the shed.